John Brennan speaks in the East Room of the White House on Monday, after President Obama announced his nomination of Brennan to run the CIA. Obama also announced his choice of former Sen. Chuck Hagel (left) to head the Department of Defense. 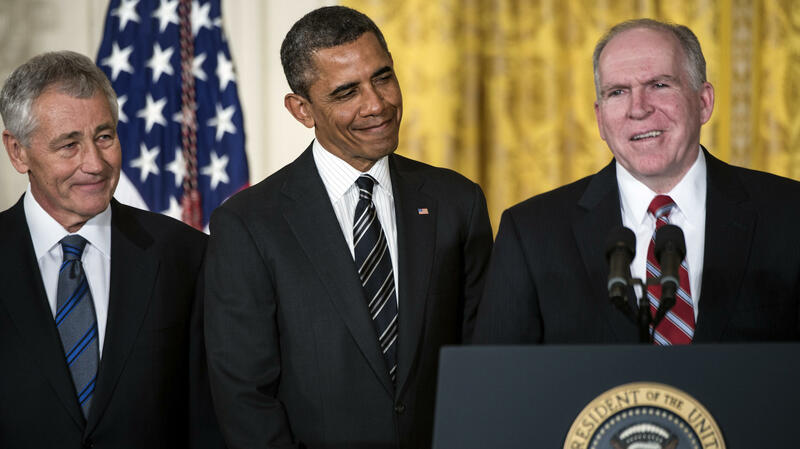 Brennan was widely regarded as Obama's choice to lead the CIA in 2009. But his service at the agency under President George W. Bush raised concerns among human rights groups, as it came at a time when the agency was using what critics considered torture on suspected terrorists. So the president instead made Brennan his counterterrorism adviser. Serving at the president's right hand might be a heady experience, but in accepting the president's offer to head the CIA, Brennan said there's no place he would rather work. "Leading the agency in which I served for 25 years would be the greatest privilege as well as the greatest responsibility of my professional life," he said. The American Civil Liberties Union said Monday it still has concerns about Brennan's counterterrorism work under the Bush administration. The group also raised a new issue: Brennan has been the architect of the Obama administration's use of unmanned drones to target suspected al-Qaida militants. Those strikes have been at the heart of the administration's counterterrorism strategy, but they have drawn some criticism, even from inside the administration. Obama's first director of national intelligence, Adm. Dennis Blair, said at a security summit in 2011 shortly after he resigned that he didn't think drone strikes were an effective strategy against al-Qaida groups in countries such as Pakistan, Yemen and Somalia. "In those places, because we don't own the ground, they're somebody else's country, the country itself is either unwilling or unable to cooperate with us against these groups. We simply cannot do it by unilateral intelligence and special forces attack," he said. "We simply cannot succeed there in eliminating these groups." In his CIA career, Brennan worked on the operations side; the president noted Monday how Brennan used to camp with tribesmen in the Arabian desert. His main rival for the top job at the CIA was Michael Morell, who leads the analysis side of the agency and has been filling in as acting director. But CIA analysts have rarely been chosen to lead the agency in the past. Amy Zegart, an intelligence expert at Stanford University, pointed out that Obama has now continued that pattern. "All presidents want action, and analysis takes time, and analysis is about threats that loom over the horizon," she said. "I am somewhat concerned that putting a person from the operations side at the head of the agency does run the risk of giving intelligence analysis short shrift." But CIA personnel from both the analytic and operational sides are likely to welcome Brennan to the agency — for reasons the president spelled out Monday. "In Director John Brennan, you will have one of your own, a leader who knows you, who cares for you deeply and who will fight for you every single day," he said. "And you will have a leader who has my complete confidence and my complete trust." Those are strong words — and they're notable because the CIA director is actually the No. 2 intelligence official in the government. He serves under the director of national intelligence, currently James Clapper. But Zegart said it is hard to see how Brennan will take a back seat in the intelligence world, coming as he does straight from the White House. "Theoretically he's taking a demotion ... to go to CIA. But we all know that when you have the ear and trust of the president, that's the most valuable currency in Washington," she said. It's possible the choice of Brennan to lead the CIA will boost the standing of the agency even in relation to the Pentagon. The CIA under Obama has taken on more paramilitary roles, while troop withdrawals from Iraq and Afghanistan may have diminished the Pentagon profile on national security issues. And Brennan's four years of service in the West Wing should give him clout in any Washington rivalries. And as we heard, the president's choice of John Brennan to be CIA director is a less controversial pick. In a statement today, the top Republican on the House Intelligence Committee said he looks forward to working with Brennan in his new role. Still, as NPR's Tom Gjelten reports, Brennan's nomination will raise some fundamental questions about President Obama's national security policy. TOM GJELTEN, BYLINE: John Brennan was widely regarded as President Obama's choice to lead the CIA back in 2009, but his service at the agency under George W. Bush raised concerns among human rights groups. It came at a time when the agency was using what critics considered torture on suspected terrorists. So the president instead made Brennan his counterterrorism adviser. Serving at the president's right hand might be a heady experience, but in accepting the president's offer to head the CIA, Brennan said there's no place he'd rather work. JOHN BRENNAN: Leading the agency in which I served for 25 years would be the greatest privilege as well as the greatest responsibility of my professional life. GJELTEN: There American Civil Liberties Union today said it still has concerns about Brennan's counterterrorism work under the Bush administration. Plus, it raised a new issue: He's been the architect of the administration's use of unmanned drones to target suspected al-Qaida militants. Those strikes have been at the heart of the administration's counterterrorism strategy, but they have drawn some criticism even from inside the administration. Mr. Obama's first director of national intelligence, Admiral Dennis Blair, speaking shortly after he resigned, told the Aspen Security Summit in 2011 that he didn't think drone strikes are an effective strategy against al-Qaida groups in countries like Pakistan, Yemen and Somalia. GJELTEN: In his CIA career, Brennan worked on the operations side. The president today noted how Brennan used to camp with tribesmen in the Arabian Desert. His main rival for the CIA director position was Michael Morell, who leads the analysis side of the agency. CIA analysts have rarely been chosen to lead the agency in the past. Amy Zegart, an intelligence expert at Stanford University, points out that President Obama has now continued that pattern. AMY ZEGART: All presidents want action. And analysis takes time, and analysis is about threats that loom over the horizon. I am somewhat concerned that putting a person from the operations side at the head of the agency does run the risk of giving intelligence analysis short shrift. GJELTEN: But CIA personnel from both the analytic and the operational sides are likely to welcome Brennan to the agency for reasons the president spelled out today. PRESIDENT BARACK OBAMA: In Director John Brennan, you will have one of your own, a leader who knows you, who cares for you deeply and who will fight for you every single day. And you'll have a leader who has my complete confidence and my complete trust. GJELTEN: Those are strong words, and they're notable because the CIA director is actually the number two intelligence official in the government. He serves under the director of national intelligence, currently James Clapper. But Amy Zegart says it's hard to see how Brennan will take a back seat in the intelligence world coming as he does straight from the White House. ZEGART: Theoretically, he's taking a demotion, right, to go to CIA. But we all know that when you have the ear and trust of the president, that's the most valuable currency in Washington. GJELTEN: It's possible the choice of Brennan to lead the CIA will boost the standing of the agency, even in relation to the Pentagon. The CIA under President Obama has taken on more paramilitary roles, while troop withdrawals from Iraq and Afghanistan may have diminished the Pentagon profile on national security issues. And Brennan's four years of services in the White House West Wing should give him clout in any Washington rivalries. Tom Gjelten, NPR News, Washington. Transcript provided by NPR, Copyright NPR.